Click Team Logo for Individual Stats. Chicago White Sox (1972-1976) for team site. Pittsburgh Pirates (1977) for team site. New York Yankees (1978-1983) for team site. San Diego Padres (1984-1987) for team site. Chicago Cubs (1988) for team site. San Francisco Giants (1989) for team site. New York Yankees (1989) for team site. Texas Rangers (1991) for team site. Oakland Athletics (1992-1993) for team site. Seattle Mariners (1994) for team site. He played 21 seasons for nine different teams, spending his best years with the New York Yankees and San Diego Padres, before retiring in 1994. In the late 1970's and early 1980's, Goose Gossage was one of the earliest manifestations of the dominating closer, with wild facial hair and a gruff demeanor to go along with his blistering fastball. 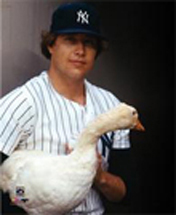 During his career, Gossage pitched in 1,002 games and finished 681 of them and earned 310 saves. He made nine All-Star appearances and pitched in three World Series. He led the American League in saves in 1975 (26), 1978 (27) and 1980 (33). He holds the New York Yankees career record for ERA (2.14) and hits per nine innings (6.59). One difference between Gossage and more recent closers is that Gossage often pitched as many as three innings to finish a game, while modern closers typically pitch the ninth inning only. Gossage lives in Colorado Springs, Colorado, with his wife Corna, and is active in the community promoting and sponsoring youth sports. His three sons Jeff, Keith and Todd also live in Colorado and enjoy hunting, fishing and golf with their dad. Corna is an avid hiker. In 1995, the City of Colorado Springs dedicated the Rich "Goose" Gossage Youth Sports Complex, which features five fields for youth baseball and softball competition. Fun Fact: What is the origin of the nickname "Goose?" Move you mouse over image to find the answer. 2006 - San Diego's Hall of Champions, Colorado High School Athletic Assoc.